For the seventh consecutive year, Baird's asset management businesses – Baird Advisors and Baird Equity Asset Management – are among Pensions & Investments' Best Places to Work in Money Management. Baird is one of only five companies that have appeared on the list every year since 2012, the first year Pensions & Investments published the list. "We are honored to be recognized for our commitment to providing a great workplace environment for all of our associates," said Mary Ellen Stanek, Managing Director, Chief Investment Officer, Baird Advisors and President of Baird Funds. "By providing a great place to work, we are able to attract talented professionals who provide the best investment results and service to our clients." 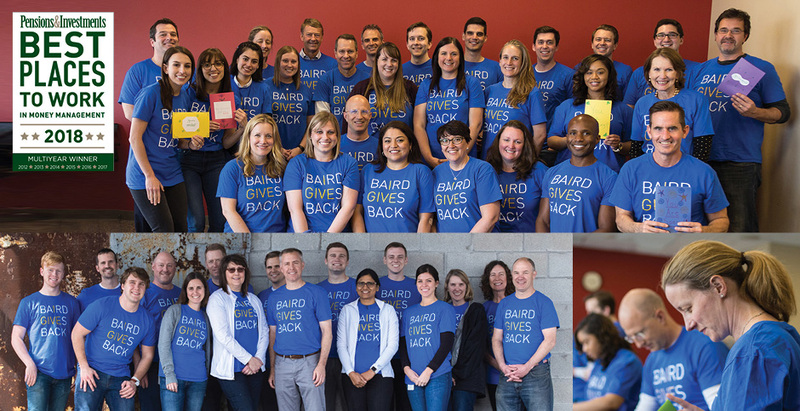 The firm's profile highlighted mentoring programs aimed at developing women leaders and Baird’s efforts to provide professional development opportunities for all associates. "Opportunities are open to anyone wanting to take on additional challenges or responsibilities to grow or do something different," wrote one associate in the confidential employee survey that firms must complete to be considered for the list. "As an independent, employee-owned firm, we know that our people make the difference and set us apart from our competitors," said Stanek. "For that reason, we have a long-standing commitment to creating a workplace environment where every associate can be their best both personally and professionally." This includes providing resources and opportunities for continuous improvement, tuition reimbursement, mentoring programs, Associate Resource Groups and leadership development opportunities. Baird was also named one of FORTUNE’s 100 Best Companies to Work For® in 2018 for a 15th consecutive year. To learn more about how P&I’s Best Places to Work in Money Management are selected, please see here (subscription may be required). Firms were honored based on the results of an employee survey and an employer survey covering company benefits, compensation and hiring practices.